On March 9, the bookstore on the corner of Lucknow’s Art Deco Mayfair building was closed to its usual stream of visitors. 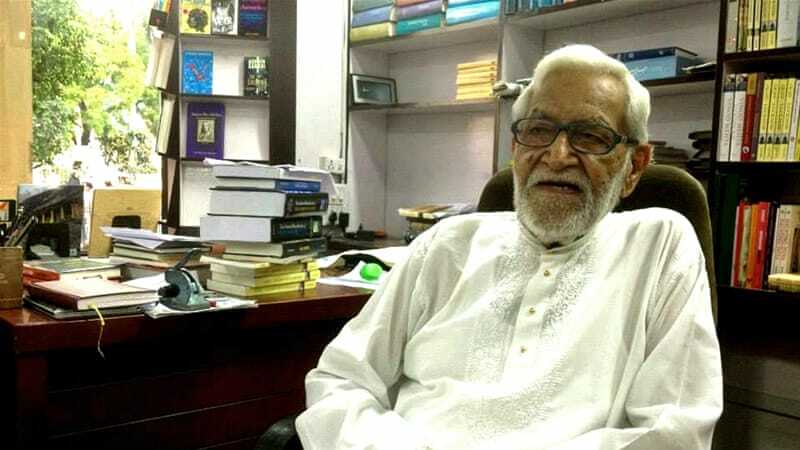 Ram Advani, the beloved bookseller who ran the city’s oldest independent bookshop, had died that morning at the age of 95. Advani, who has been lauded as one of the country’s most experienced booksellers, established his shop in Lucknow, the capital of the northern state of Uttar Pradesh, in 1948. The “Ram Advani Booksellers” founder was widely known for his soft demeanour, erudite knowledge and for embodying the cosmopolitan spirit of the city. He was an icon among both locals and foreigners, particularly scholars of South Asia, many of whom credit him for enabling their research. With news of his death, people in different corners of the world recalled the slight, charming man, his inviting bookstore and the fading history he represented. Advani was born on October 12, 1920, in Karachi, to a Sindhi family of booksellers who owned shops throughout present-day Pakistan. The eldest of five children, he accompanied his father to Lucknow in 1928 so that his father, having heard that the British had settled in Lucknow, could open a bookshop that catered to their preferences. Advani spent his formative years in the city, studying and earning his master’s degree from Lucknow University in March 1943. At the encouragement of an uncle, he went to Shimla, a hill station in northern India, where he worked at the Bishop Cotton School as a treasurer, part-time history teacher and coach of the school’s cricket team. There, Advani was surrounded mostly by foreign teachers and Anglo-Indian students. At the suggestion of another uncle, he visited one of his family’s bookshops in Rawalpindi, Pakistan, in the summer of 1945, to test the bibliophile career path. His interactions with the booksellers and customers cemented his decision to become a bookseller. “They knew how to be kind without patronising, and that made me feel very much that there is something in bookselling that is worth thinking about,” he told the Indian news channel NDTV in 2014. In 1945, his family opened a bookshop in Lahore and Advani was put in charge. But when the riots, tensions, and other distress of Partition erupted, he returned to Shimla by train, bearing witness to the bloodshed along the way. In Shimla, he opened a bookshop, but revenues weren’t sufficient and so he made his way back to Lucknow in November 1947, just months after India and Pakistan were born as two separate nations. Advani quickly secured property for a bookshop and opened it on February 15, 1948, in the heart of Lucknow – the Hazratganj neighbourhood. This was two weeks after its intended opening date, as the assassination of Mahatma Gandhi on January 30 pushed it back. The shop moved to its present-day location at Hazratganj’s Mayfair building in 1951. Advani’s bookstore became a hub of intellectual and community life in the neighborhood that, at the time, was also known as the place to see and be seen. 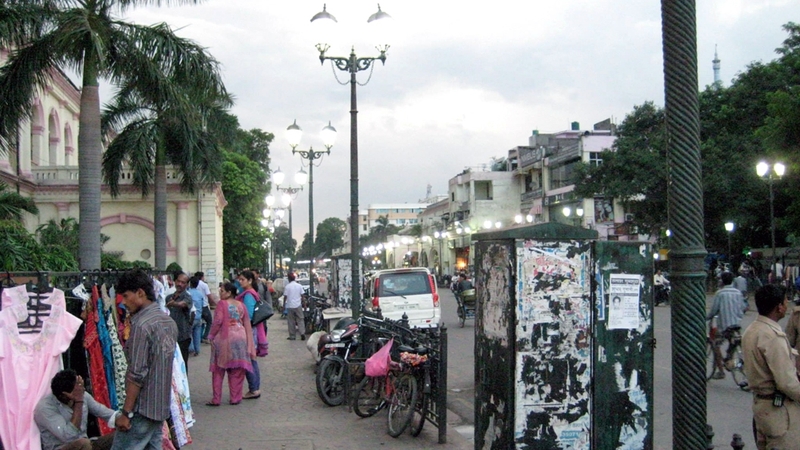 “Ganjing”, the term for dressing up and ambling along the lanes of Hazratganj, was a hallmark of life in Lucknow, a city with a vivid, storied sense of self. It holds feverishly to its old-world charm of being the land of the Nawabs, the ancient Shia rulers of the region known for their extravagant ways and elegant lifestyles, and for being a place where different religious groups and communities are said to live in peace. Yet Lucknow as a centre of high academic culture didn’t quite work out as planned, according to Rosie Llewellyn-Jones, a British historian of Lucknow who first met Advani in 1975 and has authored several books on the city. While a university had been established with high hopes in the 1920s, it went through rough patches in the 1970s and 1980s, she said, and so Advani’s shop became a refuge. 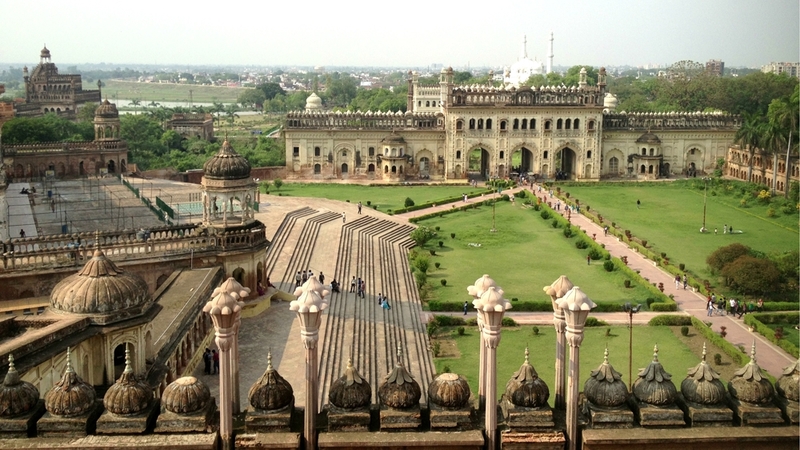 With its rich history as the centre of the former kingdom of Awadh and its political sensitivity within India, Lucknow was primed as a destination for scholars. But the way Advani positioned himself as a bookseller helped create a cascading effect for more people to come. He focused his inventory on English books, especially rare books that might otherwise be difficult to come by, and prided himself on being able to access them for customers. “He was the kind of bookseller who would look at the catalogues with the customers in mind,” says Advani’s sister Mohini Mangalik, 91, adding that he used to study the way customers interacted with the books to best understand what might interest them. William Dalrymple, a historian, writer and co-founder of India’s annual Jaipur Literature Festival, says Advani used to email him with book recommendations and about new arrivals. “He had a brilliant sense of what you were doing or wanted, so I ended up buying huge quantities of my books from Ram rather than from Amazon because he was better,” Dalrymple says. Over the years, “it would have been somewhere between 800 and 1,000 scholars”that Advani was personally in touch with, according to his son, Rukun Advani. Among his most famous patrons was India’s first prime minister, Jawaharlal Nehru. Visitors could count on an intimate, welcoming experience at the bookshop reminiscent of an old-fashioned salon. Classical music often played in the background, as Advani was a fan. He made it a point to introduce visitors to each other. Well-read on both current affairs and scholarly materials, with a love for cricket, golf and whisky, he was willing to talk at length to anyone about any topic – that is, except for politics, which he felt might create strife in an otherwise tranquil environment. “In Lucknow, what we call tehzeeb, he was a big believer in all of that,” says Rahul Prakash, Advani‘s son-in-law, referring to the city’s characterisation as mindful of etiquette. David Boyk, an urban historian and lecturer at UC Berkeley, who first met Advani while studying Urdu in Lucknow in 2006 and 2007, says the bookseller seemed nostalgic for times past – for what he considered a “quieter, saner, more dignified and respectful time. “He definitely talked about experiencing humiliations at the hands of the British. But he also, I think, missed the gentility,” Boyk says, referring to the ambiguous relationship many people of Advani’s generation felt with the British. Advani’s persona continued to amplify as other remnants of Lucknow’s colonial past, including its British Council Library and a cinema that screened only English films, shut. Scholars encouraged each other to visit him if they were to ever go to Lucknow, locals honoured him at events, and his bookshop became a Lonely Planet destination as well as a stopping point for different tour groups coming to the city. Books aside, to be in his presence and hear what he had to say was enough for some people. “As a child I was excited about what I could get my parents to buy me; as an adult I wanted to know what Mr Advani would tell me about,” says Vikram Singh Chauhan, a lawyer from Lucknow who received his first book from Advani’s shop. It is almost universally acclaimed that Advani exemplified the best of Lucknow. It is also thanks to him that people know as much about Lucknow as they do, saysLlewellyn-Jones. That’s especially true given the current reputation of the city and its state, according to Dalrymple. Advani’s death stirred the memories of those who knew him; newspapers andnumerous remembrances online paid tribute to him. He was frail following the death of Sudershan, popularly known as Darshi, his wife of more than 60 years, in June last year. “She holds the key to my heart,” hetold Outlook Magazine in 2013. After his wife died, his bookshop was the thing he looked forward to, his sister says, but he was no longer able to work after sustaining a hip injury in November. The bookshop closed the day Advani died and opened again for business the following day. His family says they’d like to continue running it, although both his two children do not live in Lucknow. But the bookshop, synonymous with Advani’s big personality, won’t ever quite be the same, they acknowledge. This piece originally published on March 20, 2016, on Al Jazeera English.